Hi, I’m Roger Frieda, your Licensed Lake Palestine Guide. I look forward to fishing with you and will try my best to provide you with a very enjoyable fishing experience here on beautiful Lake Palestine in the heart of the East Texas Pineywoods. I offer half or full day fishing trips for one to two people fishing for bass, catfish and crappie depending on the season. Frequently Asked Questions What type of fishing trips do you offer? 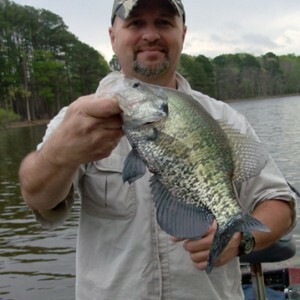 – I offer half or full day fishing trips for one to two people fishing for catfish and crappie depending on the season. What’s the cost for various trips? – Cost is $150 for a half day fishing beginning shortly after daylight until about 1:00 pm and a full day will cost $250 with an hour break for lunch. What should I bring? – Sunscreen, snacks and drinks but try to keep in small tote type cooler. – Each person must provide their own valid Texas fishing license. – You can bring your own rod and reels. Limit it to two per person, but I will provide rod and reels upon request. – Have a cooler on hand to take home the day’s catch. What about cleaning the fish? – I will filet your catch and tips are not mandatory but appreciated. Is there lodging nearby? – There are local motels and Lakeside lodging available if necessary that I can recommend on request. Roger Frieda on Lake Palestine knows how to catch Catfish. He'll put you on the fish and you'll have a great time.